In digital marketing, YouTube is great traffic platform for building relationships with customers and prospects. Because of the different kinds of ads you can create with this traffic platform, you can build relationships and move people from cold prospects to hot repeat buyers, all within the YouTube platform. For instance, you can use YouTube to establish yourself as an authority and give value to your market, and then send people to more content to learn from, such as another video or a blog post, after which you retarget them with video ads to make an entry point offer. Note that people are conditioned to skip YouTube ads. 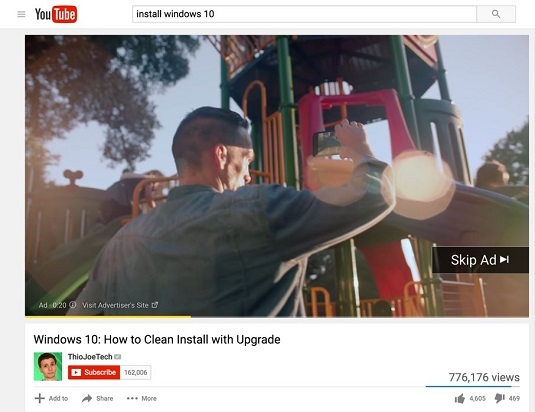 With the advertisements that play before someone else’s video, like the one from GoPro camera company you see here, you have only five seconds to grab your audience’s attention before people click the Skip button. A GoPro YouTube ad with a Skip button. Call out to your audience to grab people’s attention. For instance, you can call out to your market based on where people live (city or state) or address one of their interests. Speak to a pain point they are facing or a benefit they are seeking. Give your target audience a reason to stay by immediately providing value so that people want to visit your channel or website to learn more. Other ways to ensure that your ad grabs your target audience’s attention is to include an enticing thumbnail image (the static image overlaying your video before someone plays it) and a strong video title, also called a headline. The title and the thumbnail explain and demonstrate what your video is about. Your thumbnail image is one of the first things people see, so you want to make sure that your first impression is appealing and eye catching. If creating professional-looking images is outside your skill set, use services such as Fiverr or tools such as Canva to make high-quality thumbnail images. Then back up your image with an engaging title or headline. Include your targeted keywords within the headline (and within the video’s description) to improve your targeting.